​这张黑洞照片由”事件视界望远镜 (Event Horizon Telescope; EHT)” 拍摄, 该黑洞位于室女座的 M87 (梅西耶87) 星座中心位置, 该星座由梅西耶于 1781 发现, 是室女座星系团的中心星系. 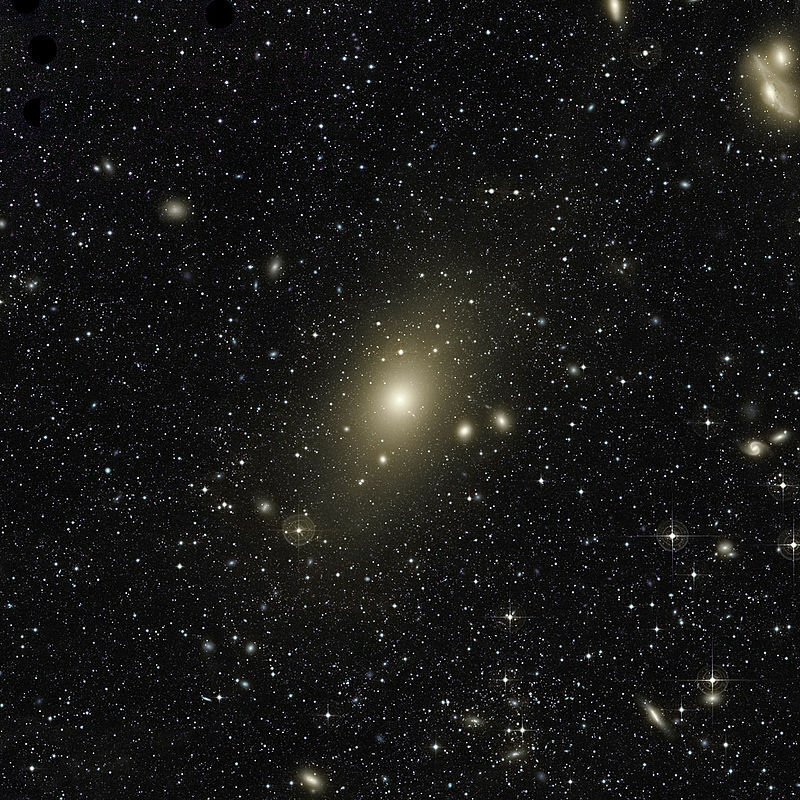 M87 距离地球约 16.4 million parsecs (53 million light-years). 事件视界望远镜(EHT)项目团队于 2017 年 04 月 05 日到 11 日之间成功的对 M87 星座进行了 4 次联合观测, 之后, 经过了大约两年的数据处理, 获得了上图所示的人类首张黑洞照片. 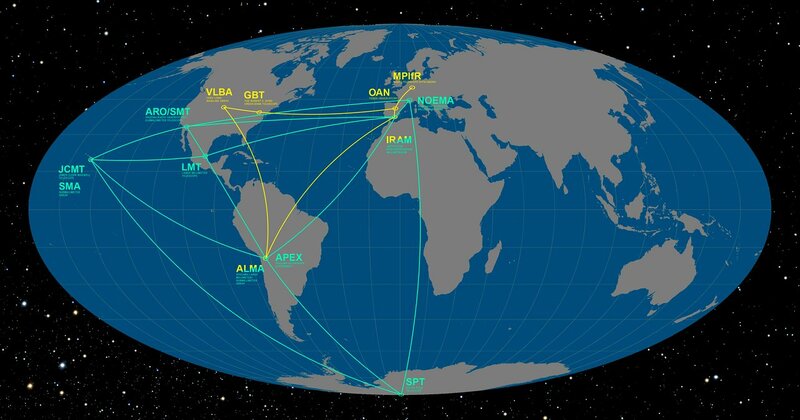 The Event Horizon Telescope (EHT) is a project to create a large telescope array consisting of a global network of radio telescopes and combining data from several very-long-baseline interferometry (VLBI) stations around the Earth. 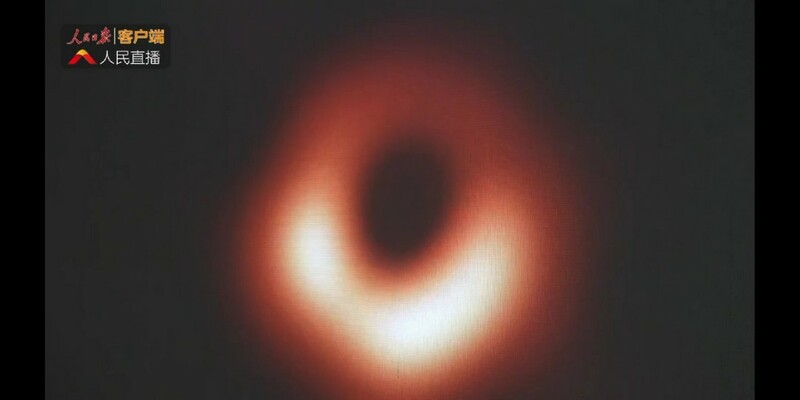 The aim is to observe the immediate environment of the supermassive black hole Sagittarius A* at the center of the Milky Way, as well as the even larger black hole in the supergiant elliptical galaxy Messier 87, with angular resolution comparable to the black hole’s event horizon. 事件视界望远镜 (EHT) 是一个创建大型望远镜阵列的项目, 该阵列由全球射电望远镜网络组成, 并结合了地球周围几个超长基线干涉测量 (VLBI) 台站的数据. 目的是观察银河系中心超大质量黑洞射手座 A* 的直接环境, 以及超巨星椭圆星系Messier 87中更大的黑洞, 角度分辨率可与黑洞的事件视界相媲美. 由于黑洞具有强大的引力, 就连光也无法逃离黑洞, 因此黑洞本身是不发光的. 但是, 在黑洞将周围的物质吸引过来时, 会形成吸积盘, 吸积盘可以将吸积物质的引力能变成辐射 (等离子体辐射), 从而就可以被我们观测到. 所以, 严格地讲, 本文一开始所展示的那张黑洞图片并不是”黑洞”本身, 而是黑洞周围的吸积盘以及位于吸积盘里面的黑洞的”影子”. 另外, 从图中我们可以看到, ” 黑洞 “的下面较亮, 上面较暗, 这是由多普勒效应引起的. 明亮的区域是等离子辐射, 在多普勒效应的作用下, 朝着靠近我们 (地球) 的方向运动的等离子体看起来会更亮, 而朝着远离我们 (地球) 的方向运动的等离子体看起来会更暗. 这次成功观测到黑洞将成为人类历史上一个标志性事件, 其意义不仅在于进一步佐证了物理学中关于黑洞的相关理论, 更重要的是这次对黑洞的成功观测证明了人类有能力对遥远的深空进行探索, 这些探索也将深刻激发人类更大的好奇心和求知欲. 而这些好奇心和求知欲正是人类探索未知的珍贵财富和根本动力.